Foods high in anti-inflammatory activity go a long way in curbing eczema development and one of those is fatty fish such as herring and salmon. 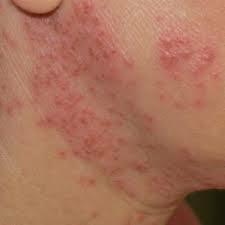 Omega-3-fatty acids, with appreciable contents in fish oil, have been widely touted a good remedy and thus consuming these fatty fish will come in handy in remedying the unsightly eczema conditions of a dry and itchy skin. A plant derived flavonoid, Quercetin is a strong antioxidant and also possesses anti-histamine activities, thus able to deter progress of inflammatory conditions synonymous with eczema in the body. Consuming Quercetin containing foods such as spinach, apples, blueberries, cherries, kale and broccoli is thus vital in preventing a dry and itchy skin of eczema. Yoghurts and similar probiotic foods contain live microorganisms that help in boosting immunocompetence, a feature which has been related to inhibit allergic reactions and inflammations that could consequently cause eczema. Other probiotic foods are kefir, naturally fermented pickles, soft cheeses and sourdough bread. Foods containing high amounts of preservatives, trans fats and other chemicals should be avoided as they could deteriorate symptoms and facilitate dry, itchy skins. These include fast foods, margarine and processed foods of all kinds. Insulin levels are heightened with more sugar and this triggers inflammation afterwards, thus, these food products which include burgers, cakes, coffee drinks and sodas are better absconded. Since eczema is inflammation facilitated, substituting your diet for anti-inflammatory foods is thus a necessity for persistent eczema sufferers. The emphasis here is on foods such as vegetables, fruits, whole grains, omega-3-rich fish and healthy fats like olive oil.